Since the airport opened in 1995, it has consistently won readers&apos; choice awards from publications like Business Traveler Magazine, including again in 2009. And in 2018, the Wall Street Journal put DEN at the top of its first U.S. airport rankings for treating travelers better. The airport offers free Wi-Fi access in public areas and a diverse array of dining and shopping choices. 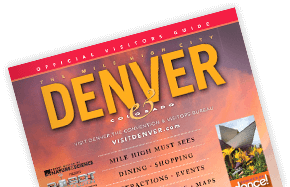 Tourist Information can be found at VISIT DENVER&apos;s Tourist Information Center, located in the Main Terminal Building on the 5th floor. Hours: 8:00am to 5:00pm, 7 days a week. *Guides, maps, and brochures are available 24 hours a day. Up-to-date Airport Information can be found at 303-DIA-TIPS (8477) or FlyDenver.com. The DEN Ground Transportation Information Counter is located on Level 5 of the main terminal, in the center core. Also on Level 5 are on-airport rental car desks, shared-ride shuttle desks, and baggage claim. For more information, call, 303-342-4059. Passengers will find all commercial transportation outside the Level 5 doors. Passengers must proceed outside to the appropriate island to obtain transportation. *Note: East side has odd numbered doors; West side has even numbered doors. The platform for the new airport rail service is located on Level 1. It&apos;s now easier than ever to get from DEN to downtown Denver. At a cost of $10.50 (with several discounts available), each way travelers can use the new rail service, known as the A Line, from the airport to Denver Union Station and vice versa courtesy of the Regional Transportation District (RTD), metro Denver&apos;s public transit provider. The A Line, accessible on Level 1 of the main terminal, whisks travelers to the heart of downtown, specifically the recently restored Union Station, which is the city&apos;s new transportation hub and "living room," thanks to its plush surroundings. From Union Station, travelers can access additional local and regional transportation services, such as light rail, regional and local buses, Amtrak rail service, taxis, and the free 16th Street Mall shuttle (MallRide) and free downtown MetroRide buses that provides access to most downtown hotels. Union Station itself is a beautiful 1914 Beaux-Arts building and the location of hip, locally owned restaurants, bars, shops and a boutique hotel. The airport rail has six stops along the way and takes approximately 37 minutes. Services from Uber and Lyft are available to and from the airport. If you’re a new Lyft user, enjoy up to $20 in ride credits. Simply download the Lyft mobile app, enter the VISITDEN code under the app’s “Promos” section, request a ride and you’re on your way! **Trips into DEN from downtown, DTC, or Boulder are NOT subject to any gate fees; only those trips going out from DEN. *Shuttle company prices range between $25 one way/$42 round trip. Please contact each company directly to confirm their group/convention rates. Shuttles operate daily from 4:30am until midnight, serving all downtown and Denver Tech Center hotels to/from DEN. The full price between the airport and downtown hotels is $25 each way. Travel time is 45-60 minutes, depending on hotel location and number of stops. Reservations may be booked on-line, via the SuperShuttle app, via telephone or just stop by the SuperShuttle counter on Level 5 at the airport. Shuttles will stop at the Colorado Convention Center with advance reservation (2 hour minimum notice).